Serge Gnabry scored twice for Bayern Munich and Kingsley Coman provided the winner in extra time as Bayern defeated Hertha Berlin 3-2. After Bayern Munich had narrowly beaten Hertha BSC in the German Cup, Niko Kovac went out of his way to praise the performance of James Rodriguez. "He played really well," said the Croatian manager. "His composure on the ball in tight spaces was very important in a game of many 50-50 duels. With him, we have a lot more quality." There was, of course, an element of PR involved. James, Kovac implied a few weeks ago, is one of those players who takes criticism very personally and needs to feel the love of his superiors and colleagues to really shine. But if the 47-year-old's aim was to placate a bruised ego with warm words in public, it was helped immeasurably by the fact that it was also all true, without any need for exaggeration nor embellishment. When his loan deal expires this summer, will James Rodriguez return to Bayern Munich? James, together with the recalled pass-master Thiago in front of the defence, had indeed ensured that the ball had been a friend of this Bayern team once more. Hertha, exhausted by 120 minutes of chasing shadows, eventually just collapsed. There was, though, just one problem for the manager in showering the on-loan Real Madrid midfielder with compliments, and perhaps it began to dawn on him when he said that his central players had often "just kicked the ball away" in pressurised situations in previous games. It raised the obvious question: Why hadn't he thought about putting "more quality" on the pitch earlier? The way he spoke about James' calming influence on a side who had been unable to get their passing game going without him, it almost sounded as if he had had nothing to do with picking the team before Wednesday. Maybe the way Kovac sees it, James' relative non-involvement wasn't really down to him. Physically, the player wasn't in the best of shape at the beginning of the season after picking up an injury halfway through the World Cup. When the Bayern coach started rotating his men in an effort to keep everyone happy, James took it badly, and Kovac perhaps didn't have the special man-management skills that allowed his predecessor, the saintly Jupp Heynckes, to get everyone onside all the time. The result was a clash, with James reportedly reminding the former Eintracht boss that he wasn't in Kansas -- well, Frankfurt -- anymore. The club never denied Sport Bild's story, which spoke volumes about the struggles of a relative novice in the job to control a dressing room full of egos and used to working with big-name managers. Furthermore, Kovac's hand had been forced by James missing the last weeks of 2018 with a knee injury and the player repeatedly being late for team meetings. 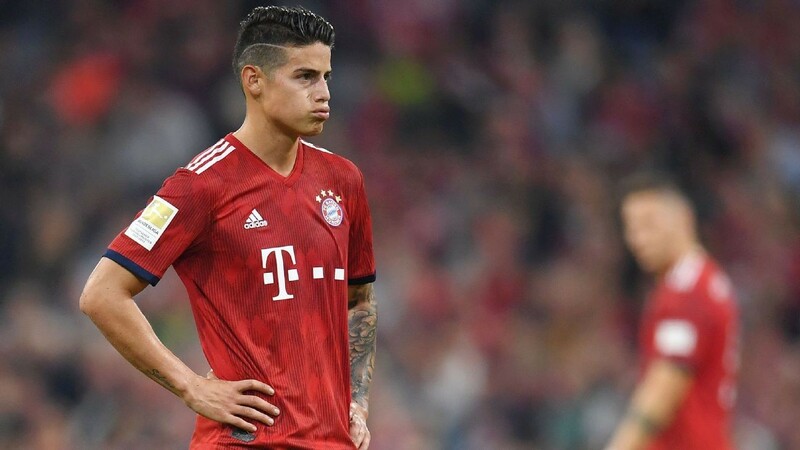 Club and coach might have indulged those minor indiscretions if James had made himself indispensable, but in 20 months at the Allianz Arena, he's never quite made it his team. Despite all his undeniable skill, he's not done enough to convince successive coaches that they should build their team and system around him and his preferred No. 10 role. What he really wants, in terms of importance and freedom on the pitch, is probably unattainable at Bayern. On top of that, there are serious doubts whether he really wants to stick around for much longer, either. His father Wilson this week talked up the potential of James joining Juventus at the end of his loan this summer. Bayern, on the other hand, must work out whether they want to take up the option to make his move permanent for a relative cut-price €42 million. In terms of international exposure, the player has proved one of the club's biggest draws, especially in Latin America, but that has to be weighed up against the potential negative effect of keeping a star effectively against his wishes. The only thing worse than an individualist in the dressing room is an unhappy individualist in the dressing room, combined with a manager who is still learning the ropes at this level. All of this explains why Bayern want to make the decision as late as possible, but it's hard to see how the underlying dynamic can really change. For that to happen, James would have to show similar performance levels against Liverpool in the Champions League (at least) and maybe a managerial change, too. Stranger things have happened in football but as things stand, Bayern fans are best advised to enjoy the South American's trickery while they can. He's unlikely to wear the red shirt again come August.